We are among leading entities, engaged in offering supreme quality Lux Soap that is known for its optimum quality and cost effectiveness in the market. This soap is processed at our vendorsâ€™ high-tech production unit by utilizing supreme grade chemical compounds and the latest machines. The soap provided by us keeps the skin glowing and silky making it soft for long hours. Being one of the reliable organizations, we are instrumental in providing superior quality range of Lux Soap that is obtained from the certified vendors of the market. Offered products are formulated by the use of finest quality ingredients and upgraded technology in compliance with set international quality standards. The new soap bars are derived from algal oils of the highest quality, sourced from oil-producing microalgae that have been cultivated in a sustainable and responsible way. The soaps are already on shelf in Brazil. We as a Trader offer Lux Soap and we are dealing in Local area only. Algal oils are widely considered to be an alternative to tropical oils such as palm oil, which has been linked to deforestation. Over the past five years Unilever has been working with algal oil producer Solazyme to research new ways to incorporate the sustainable oil into its products. Lux works with the world's best perfumers to create beauty treats infused with the finest fragrances. Our goal For each Lux shower to be a delight to the senses, making women feel fabulously feminine, everyday. Because we know, when women feel this way, they get a lot more out of life. 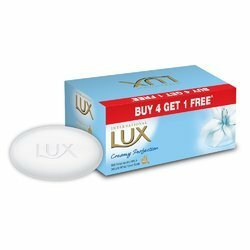 Being a trustworthy organization of this area, we are extremely involved in offering the best grade of Lux Soaps to our patrons. These are available in different packing option at nominal costs.